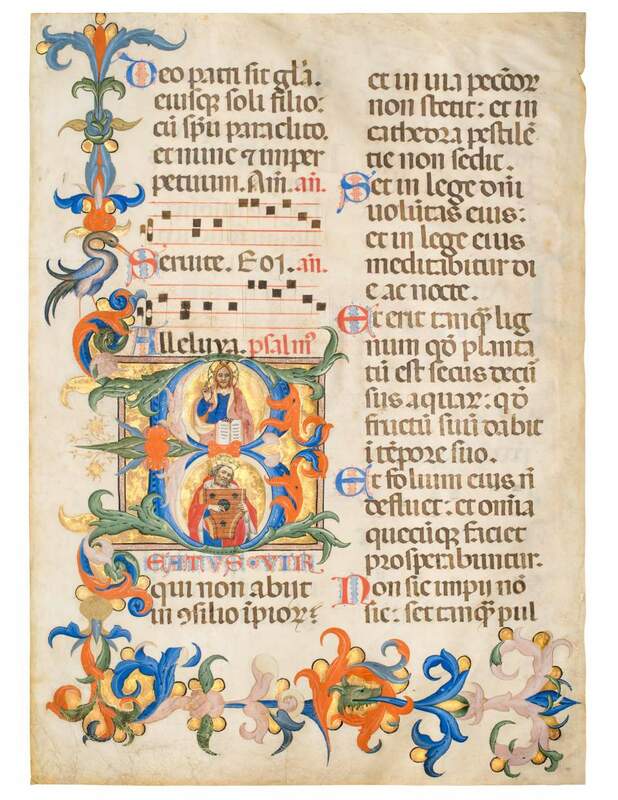 Historiated initial B[eatus Vir] on a leaf from a Choir Psalter in Latin attributed to Don Simone Camaldolese. Don Simone, originally from Siena, was a Camaldolese monk at Santa Maria degli Angeli in Florence – a monastery renowned for its scriptorium. He seems to have been trained in the circle of the leading illuminator in Siena, Lippo Vanni, who himself worked in Florence from time to time, especially toward the end of his career. Specializing exclusively in book illumination, Don Simone’s workshop became the best address in Florentine book arts. This initial B is constructed of ribs of blue buttressing acanthus leaves set on a ground of burnished gold. The luxurious foliage, vivid palette, and stylistic details of initial and borders are characterising features of the illuminator Don Simone Camaldolese's work. Within each of the bowls of the letter are the precisely-rendered figures of Christ and King David, suggesting a date of the early 1380s, predating the artist's move toward a simplification of forms that became distinctive to his later style. This leaf thus is a fine example of his work as he was developing and fully assimilating Florentine character into his Sienese style.